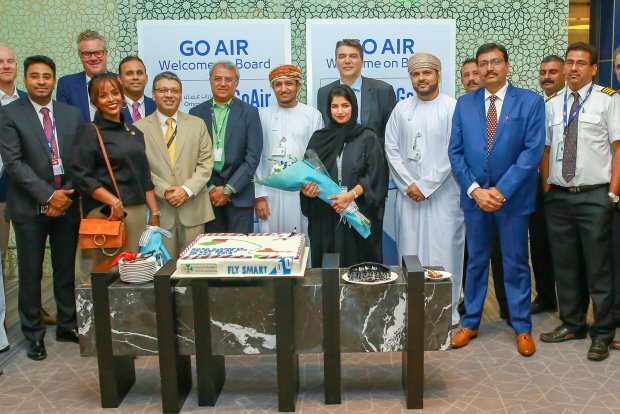 Muscat International Airport welcomes GOAir to it's growing Family! Muscat International Airport welcomes new low cost airline GoAir with three weekly flights between Kannur International Airport (CNN) and Muscat International Airport (MCT), connecting the two cities with flights operating every Wednesday, Friday and Sunday from Muscat to Kannur and every Tuesday, Thursday and Saturday from Kannur to Muscat. GoAir’s inaugural flight from Kannur to MCT was received with much fanfare, as the Indian subcontinent remains one of the most popular destinations for travelers departing from MCT. In addition, Kannur itself is a popular leisure and business destination within the state of Kerala. GoAir is India’s fastest growing airline and it is committed to providing travelers value for their money through the highest standards of customer service delivery and affordable air fares. With its fleet of 49 Airbus A320 and Airbus A320neo aircraft, the airline offers more than 230 daily flights and approximately 1,600 weekly flights across 28 destinations – 24 domestic and 4 international. The inaugural GoAir flight from Kannur touched down on Friday March 1st at 00:05 local time (LT).